Every student who wills to get admission in M. Tech and M.E. programs as post-graduation course or to get Ph.D. doctorate degree from esteemed institutes like Indian institute of technology, various Nits and IISC, has to go through a common exam named GATE, Graduate Aptitude Test in Engineering. Engineering graduates, who are willing to get employed into various public service units, will have to go through the GATE exam as it’s the initial step for getting selected. Students, who are aiming to the GATE exam 2017-18, now have been involved in GATE exam preparation. They are quiet confused as the pattern has some changes in comparison to GATE exam 2016 and the ignorance in students are increasing the confusion. Here the changes in GATE 2017-2018 have been listed and described, that would be beneficial for the students to understand the changes and then planning the GATE exam preparation according to them. GATE exam 2017-1018 is going to be organised by Indian institute of technology, Roorkee and it has posted new updates and changes on its website. The exam will be conducted 4-5 February 2017 and 11-12 February 2017 having online mode. Interested students can check the new changes introduced in GATE 2017-2018 as the GATE exam details are published there. Appearing students in GATE 2017-2018 exam are in doubt about the changed admission procedure, changed exam pattern and the changes introduced in question paper pattern. According to a notice published by Indian government, GATE scores will be taken as deciding factor for the recruitment procedure and Ministry of Human Resources Development had decided for introducing following new features in GATE 2017 entrance exam. As per modified examination pattern, a new unit on oceanic and atmospheric science has been included in engineering science paper as section H. With this new section, now engineering science (XE) paper has eight sections as A to H.
GATE exam 2017-2018 is scheduled to be conducted on 4-5 February 2017 and 11-12 February 2017 in two sessions as Forenoon session scheduled as 9 am to 12 am and the afternoon session decided from 2 pm to 5 pm. Students should be attentive as the timings of GATE 2017 exam at International centres for GATE exam will be according to the local time. Here are the do’s and dont’s for those who are self studying for GATE 2017. Given with all these changes, there is an expected drift in the education industry all over the world. Gorakhpur, a city in Uttar Pradesh has been introduced as new examination center for GATE 2017 exam by Indian institute of technology, Roorkee. With this decision, students living in Uttar Pradesh’s east region and Bihar would get benefits of a nearby exam center. Now from 2017-2018 onwards, GATE exam will be conducted also in foreign countries. According to administration, GATE exam will be conducted in Ethiopia, Bangladesh, Singapore, Nepal, United Arab Emirates and Sri Lanka. Pattern of exam will be same as prescribed for India and exam schedule will be notified in admit cards. International aspirants should be in final year of the course or should have completed Bachelor’s course in Engineering or Master’s program in Science in respective subject. An admission portal would be developed on official GATE website for the admission of international students. As in GATE exam 2016 there was no restriction for the selection of second city in application, now it has been changed and applicants are allowed to select the second city only in same zone as the first city selected. That could be anywhere in India but still in same zone. Another feature added in application is uploading of thumb expressions. Candidates having relevant degrees must upload scanned file of degree completion certificate or mark sheet of final year. Candidates who are in final year of the program must upload the scanned image of last year’s mark sheet or provisional letter issued for the respective institutes to prove their eligibility. GATE being one of the most prominent exams has gone through this complete revision for the reason if the prominence of the same gets established in other foreign countries, the expansion would occur. This will help in pushing the boundaries of the academic environment, which in turn will encourage the student diversity, culture and wisdom around the community. The exam will be conducted in a wider range of countries including Ethiopia and Nepal. 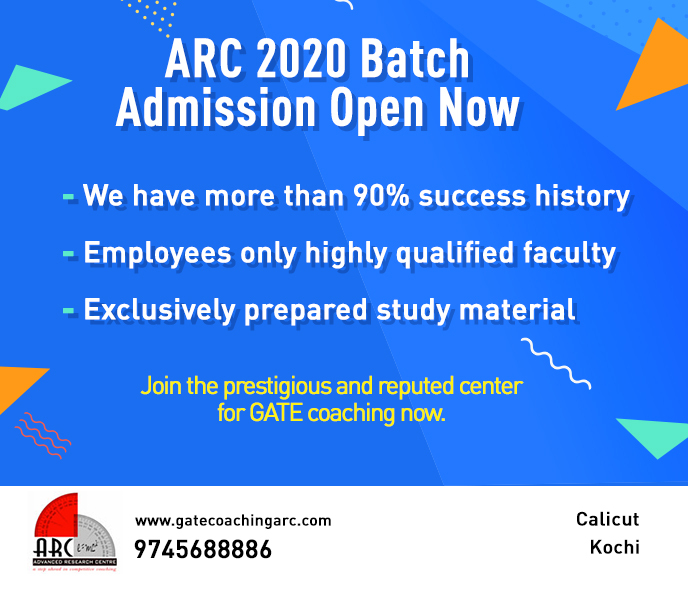 ARC Foundation is one of the best GATE coaching centres in Kerala. We have a legacy of training aspiring candidates to help them crack GATE examinations. Contact us for the latest updates and enroll today.